So why might someone make their own body care products? Well at the moment, I can think of about 72 million reasons. The function of any baby powder is to keep moister areas of the body dry. So our goal is a powder that is moisture absorbing without being irritating or drying to the skin. The powder should be gentle and soothing, and the texture should be light, fine and silky – not itchy or clumpy. Ingredients should be food-grade or otherwise accepted as very, very safe. There are several powders that can help us meet our talc-free baby powder goals. • Cornstarch – Food starch derived from common corn, used to thicken sauces and in baking. Very silky with good absorptive properties for both moisture and oil. Widely available. Can go on a bit clumpy when applied to skin on its own. Folks avoiding GMO products will want to be careful here. See note. • Arrowroot Powder – Food starch derived from a South American tuber, used to create translucent sauces and glazes. Extremely light and silky in texture, and very gentle when used in body care products. See note. • Kaolin Clay – A finely ground, off-white, cosmetic clay powder with excellent absorptive properties without being overly drying. Smooth and very gentle on skin. Can be very slightly gritty, with a texture like baking soda, and is alkaline, so plain Magnesium Carbonate powder might be irritating to sensitive skin or areas of the body. However, where moisture absorption without gumminess (think deodorant) is desirable, I think it’s a great ingredient. • Baking Soda – Advantages: ubiquitous, inexpensive, odor absorbing. Disadvantages: gritty, alkaline and often irritating if left on the skin or used in large quantities. I use baking soda in my homemade deodorant, and in many products from toothpaste to body scrubs where a little abrasiveness is an asset. Note: I generally prefer arrowroot to cornstarch for skin powders because it seems, anecdotally, to be less likely to irritate sensitive skin. But if arrowroot powder is difficult to find, or if cornstarch fits your price-point better, you can substitute some or all of the arrowroot 1-to-1 for cornstarch in your talc-free baby powder. You don’t need to add essential oils. They are totally optional. But let’s be honest -everything is more fun and better smelling with essential oils. And there’s a good chance you have a few basic essential oils around, anyway. I’ve given some suggestions for specific essential oils below in the formulas, but you can modify these. I don’t recommend increasing the total number of drops of essential oil, but within a few limits, you can pick the brand and varieties of essential oil that appeal to you. Do keep in mind that whatever essential oils you select should be skin-friendly and non-irritating. If you aren’t sure, stay away from any essential oils that sounds like a citrus (orange, lemon, bergamot, etc. ), a spice you might use during holiday baking (cinnamon, clove, etc. ), or a type of gum (peppermint, spearmint). This goes double if you’ll be using your baby powder on actual babies. No one ever went wrong with lavender. 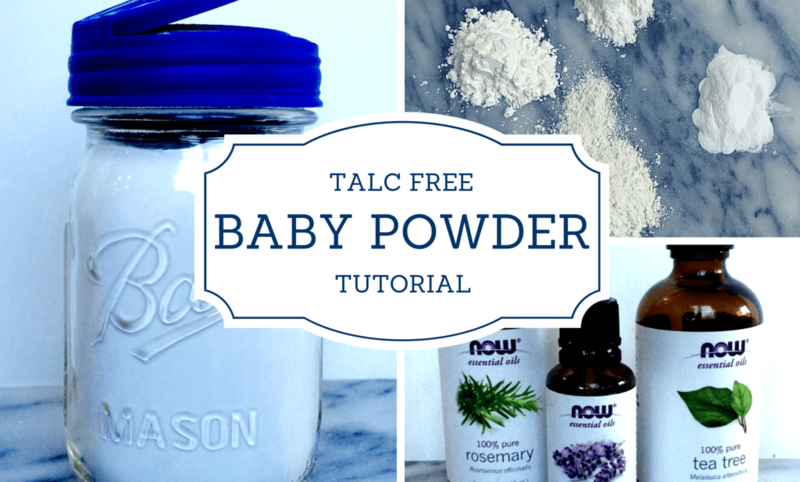 There’s more than one way to blend DIY talc-free baby powder. Here are four options to suit a wide range of budgets, skin-types and moisture-absorption levels. All formulations make about 1 total cup worth of powder and will last at least 6 months if kept away from moisture, though the essential oil scent may fade over time. The advantages: no funny ingredients or essential oils – just inexpensive grocery staples you probably already have. The disadvantages: a nearly 100% cornstarch powder can be “clumpy” on the skin if it’s applied too heavily, and baking soda can be irritating to sensitive skin. But if simple and/or frugal is the priority, this is a great option. Blend cornstarch and baking powder well in a small bowl. Store in an air-tight container. To apply, sprinkle a small amount of powder onto your hand or directly onto your skin, then smooth the powder over your skin. Avoid the face and neck, and be cautious about other sensitive areas of the body. Avoid inhaling any body powder. With only the most gentle ingredients, this blend is what I’d recommend if you plan on using this baby powder on actual babies. Ask your pediatrician before using this – or any – powder on babies younger than 3 months. Blend arrowroot and kaolin clay well in a small bowl. Add essential oils, if using, and blend well to distribute the essential oils. Store in an air-tight container. To use, apply, sprinkle a small amount of baby powder onto your hand away from baby’s face, so baby doesn’t inhale any of the powder. Gently apply the powder from your hand to baby’s body, avoiding baby’s face. Gentle enough for adults to use all over as a body powder. The essential oils recommended here remind me of a more “traditional” feminine baby powder smell; if you prefer a more gender-neutral scent, try the essential oil options recommended in the Super Dry Moisture Absorbing Powder, below. 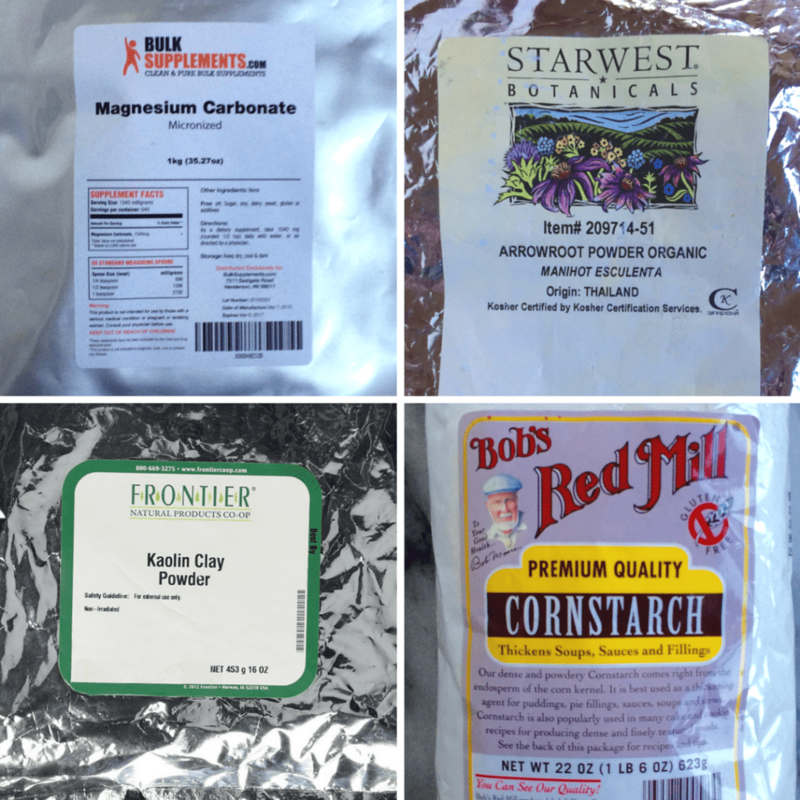 Blend arrowroot, kaolin clay and magnesium carbonate well in a small bowl. Add essential oils, if using, and blend well to distribute the essential oils. Store in an air-tight container. We’re worried about Baby Powder? Really? From what I can tell, the science is still out on what degree of risk talc-based body powder poses. As you would expect, Johnson & Johnson says cosmetic talc is well established as safe. A 1999 study published in the Journal of the National Cancer Institute suggests talc use doesn’t increase additional ovarian cancer risk overall, but does modestly increase the risk of invasive and serous ovarian cancer. Long term use and application of baby powder on the…uh…more sensitive parts of the body, seem tied to increased cancer risk. So if you regularly powder your junk with talc-based powder, you might wanna stop. That said, while we don’t want to take unnecessary risks with our health, we also don’t want to make ourselves sick with worry about stuff like this. You do things every day that are far more risky than using baby powder. So, you know, perspective is good. Whenever I’ve used a cornstarch based powder I get skin infections. I think the starch actually FEEDS the bacteria. Could be; could also be the powder is disrupting the acid mantle of your skin. In any event, if body powders don’t agree with your skin I’d continue to avoid them in your situation. Erica, you are the best. I have a body dusting powder that I like, but don’t love the fragrance that comes with it. It’s a “fragrance”, not an essential oil. I did a quick search of the ingredients, and low and behold, they are essentially working with the same stuff here. With a couple of tweaks, I bet I can replicate it. Happy day! I only ever use talc to soak up moisture before waxing body hair (otherwise, sugar wax melts against the skin JUST enough to tug painfully instead of ripping out). However, the smell of ‘baby powder’ gives me a headache. Thanks for the arrowroot suggestion – I’ve got some in my pantry, I don’t know why it hadn’t occured to me to use that instead! Thank you for the information and all the formulation options. This would be a really useful and cool baby shower gift! I think Imma need to order some of these goodies. So have you used your formulation on a serious sweat day? Like heavy gardening in the heat? I take a medication that increases sweating. It’s like living a perpetual hot flash. Needless to say powder is a friend, but I’d hate to be a clumpy, gummy mess. I want wicking clothing embedded with powder, can you develop that next? My baby has very sensitive skin and prone to allergy. I don’t know if I can use this. Where do you find these containers and lids?? 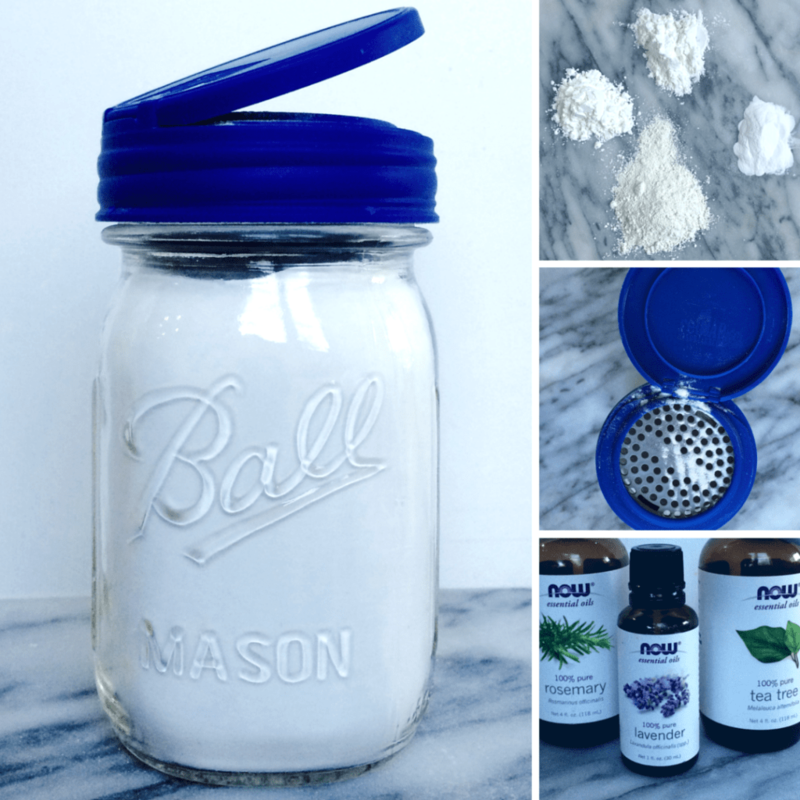 Where can I purchase the blue top for the mason jar? I’ve been looking for one as well! Where did you get that lid for the ball Jar, I swear I’m going crazy, I’ve been looking for one all over the internet! !